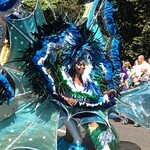 A few weeks ago I went to along to Luton’s annual Carnival. It was held on Sunday 26 May. The town seems to be taking a bashing recently so it was good to see the positive face of Luton on show. The weather was good and the atmosphere was relaxed. The carnival seemed to be a slightly smaller affair than the last time I went along to it, but no less enjoyable. The parade also had more of a Latin element than I seem to remember from before — which I also appreciated. Luton Carnival 2013, a set on Flickr. I’m editor and designer for Luton’s Community Magazine. I was just hunting for an image to support an article that I’m including in the August edition regarding volunteer work. The volunteers helped with this year’s carnival so I thought I nice colourful pic would be great on the page. Searching for just an image I came across your blog – could I possibly use one of your images? Obviously I will credit you as photographer on the image with a link to your blog. If you’re happy with this, could you email me a high res copy of an image of your choice? No problem. I have sent you an email.